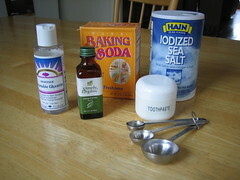 We have all heard about the many uses for baking soda, the natural cleaner. But have you tried brushing your teeth with it? Baking soda has been used as a tooth cleanser for over 150 years. Somehow it got the reputation as being abrasive, therefore detrimental to the enamel. Nothing could be farther from the truth. Toothpastes are rated on a scale from 0 – 200according to their abrasiveness. This is called the RDA value or “Relative Dentin Abrasiveness”. Pure baking soda has an RDA of 7. The closest RDA to this is 35, which is Arm & Hammer baking soda toothpaste. TheRDA’s for every other tooth paste on the market just go up from here. You can read more about toothpastes and their respective RDA values here. There are many reasons for using baking soda for brushing teeth. It is not only the least abrasive substance to use but it also whitens teeth, removes stain, and is also an effective germ killer against the bacteria that cause tooth decay and gum disease. Baking soda or sodium bicarbonate is a white, crystalline, slightly alkaline powder. This weakly alkaline baking soda, when dissolved in water, releases free radicals. When baking soda is put into the mouth, the free radicals from the mixture interact with the stain molecules on the teeth enamel and oxidize the yellow and brown stains on the teeth. Thus, baking soda breaks down the discoloration of the teeth, thereby brightening and whitening the teeth that have stain built up from drinking tea,coffee, colas, chewing tobacco, and smoking. Besides oxidizing(scraping off) the stains on the teeth baking soda also removes plaque form the teeth. Plaque removal prevents the teeth from decaying and also freshens the breath. The alkaline baking soda helps to neutralize acidic bacterial wastes. The higher the pH of the mouth the better, as decay causing bacteria does not thrive in an alkaline environment. Overall, brushing with baking soda is believed to enhance dental health. That is why so many people who have been using baking soda all their lives appear to have healthy teeth and gum. If you are concerned about the absence of fluoride when brushing with baking soda, you can simply put some commercial fluoridated toothpaste on your toothbrush. Then dip the toothpaste brush into the baking soda. It will pick up the right amount of baking soda to make a nice paste. Use that to brush with. A side note regarding fluoride: The benefits of fluoride and fluoridated water have been a controversial matter for a long time. There are not many experts who feel that toothpaste should not contain fluoride at all, nor should the public drinking water! The EPA (Environmental Protection Agency) and ADA(American Dental Association) just recently lowered the allowable ppm (part per million) of fluoride in drinking water from 1.2 ppm down to .7 ppm. Many countries have banned public water fluoridation altogether. ADA, on the other hand,has always supported and recommended the use of fluoride in toothpaste and adding it to drinking water for its role in cavity prevention. For more information on this controversial matter please refer to our previous blog post about fluoride here. 1) It is best to pour some baking soda into a small dish or container so that it can be discarded every few weeks and replaced with fresh baking soda. Day after day of dipping your wet toothbrush into the powder causes it to clump up. 2) Dampen your toothbrush with water. You can also dampen it with mouth rinse if you want to disguise the taste of the baking soda. 3) Dip the toothbrush in the baking soda and get as much baking soda to stick to it as possible. 4) Brush your teeth for two minutes. Start brushing the biting surfaces of the teeth first. Brush for 15 seconds or so to allow the baking soda to mix with the saliva and become creamy. If you place the powder directly on the gums before allowing it to mix with the saliva it can irritate the gums. 5) Brush the tongue for 20 seconds as well. Many germs live on the tongue. 6) Rinse with clear water or with water that is flavored slightly with mouth rinse. This will give the mouth a fresh, minty taste. I personally believe in using products with little or no preservatives with natural ingredients. Where toothpastes contain all kinds of chemicals which may induce allergies and canker sores or exacerbate recession and enamel abrasion, using baking soda as “toothpastepowder” seems to be a great alternative for commercially available toothpaste. Baking soda is the least abrasive agent and a great stain remover. It also slows down the growth of the bacteria which causes tooth decay and gum disease by increasing the pH of the mouth. It is also very cost effective for the entire family. If you don’t like the salty taste and would like to add fluoride to your oral hygiene routine, please use a fluoridated mouthwash in combination with baking soda and give your teeth a chance to be brushed with the least abrasive agent which also has many other benefits. Which Toothpaste is the Right One for You? Does It Matter What Kind of Floss I Use? What Is Acid Erosion of the Teeth? Who Really Cares about Public's Dental Safety and Health? What Is the Best Tooth Brush to Buy? Health Insurance Coverage, Who Really Benefits?